Day one of the ERA Regional Airline Conference 2019 opened in Prague today, 27 March. 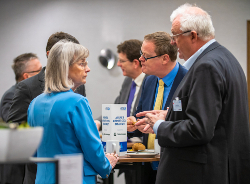 This annual event increases in popularity every year and more than 260 delegates attended the 2019 conference. The Airline and Airport CEOs’ Breakfast and Meeting kick-started the day, which included informative presentations from representatives from JLT Speciality , Baines Simmons and Wings Alliance. Henk Ombelet, Head of Advisory Operations, Ascend by Cirium – Future aviation market trends in Europe. Pearce, Diaz Pulido and Ombelet all highlight the many challenges facing the European and regional airline market at the moment. Diaz Pulido highlighted the seven main challenges and areas of focus she sees: safety, security, sustainability, competitiveness, connectivity, citizens and capacity. She continued to describe these in detail and the EC’s plans to evaluate them in more detail over the course of the year with the help of the industry. 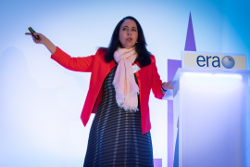 Finally, Ombelet spoke of geopolitical and economic threats as well as growth cycles, from Brexit to the environment, providing the company’s analysis and statistics throughout. The leaders of ERA’s aircraft manufacturer members took to the stage in this session to chat about the key industry focusses for our business, from product development and future market trends, to industry challenges and the future of air transport in Europe. 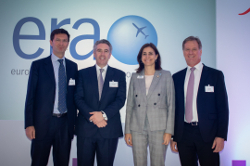 With ERA Director General, Montserrat Barriga, leading the debate, Stefano Bortoli, CEO, ATR; Colin Bole, Senior Vice President Commercial; and John Slattery, President & CEO, Embraer Commercial Aviation all joined the discussion. The speakers began by providing an overview of their business’ current ventures and the new and innovative programmes they have/are rolling out. Though they showed competitiveness, they all agreed that innovation is only valid when supported by economic requirements. In addition to this, the environment, ACMI and the pilot shortage were all discussed. Bole provided the figure that 50 per cent of pilots by 2027 have not yet started training and stressed that training capabilities need to increase sooner rather than later. Bortoli highlighted that with the rising cost of training, better investment needs to be made to open up the career path to all income households and Slattery added that with less than four per cent of pilots being women, more also has to be done to get women interested in aviation, as well as science, technology, engineering and maths (STEM). Delegates regrouped at the evening’s cocktail reception to network and continue discussing business opportunities. A great close to a fantastic first day.